Kyalami Park is in the privileged position where getting back to nature couldn’t be easier. It’s a perfect example of how nature and business can co-exist in a harmonious way. Many years ago the Park embarked on a full scale tree planting programme putting them in the privileged position today of having many large indigenous trees such as Stinkwoods, Acacias, Combretum, Coral and Rhus. Not only do these trees provide a habitat for many bird species, they also provide welcome shady spots in the summer months and reduce frost damage to sensitive plants during the winter months. The Park is also privileged to have an abundance of green landscapes, water features and indigenous fish filled pond areas. Time spent taking advantage of these natural surroundings is guaranteed to reduce stress levels and have a profound effect on our well-being. Amongst the indigenous plants an abundance of flowering shrubs and perennials cast a rainbow of colour – Tecoma, Plumbago, Bulbine, Agapanthus, Tulbaghia and Gazania - and are as pleasing to the eye as they are to the local insects and nectar eating bird populations. Sights of Sunbirds, Bulbuls, White Eyes , Shrikes, Bokmakieries and Cuckoos are not uncommon. 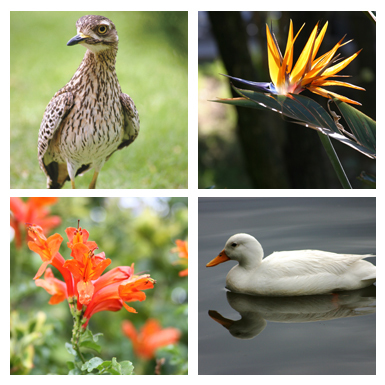 The Park boasts several parks, dams and reed areas which are home to a wide variety of water birds. Herons, Coots, Cormorants, Hamerkops, Ducks, Darters, Moorhens, Egyptian Geese and Kingfishers can be seen feeding and nesting here. Weavers nest in the reeds and near the water which abounds with frogs, fish, toads and the occasional terrapin or water monitor. Kyalami Park is also home to many garden and bush birds, a lucky few may even catch sight of a March Owl, kite or Snake Eagle. The leafy streets, well kept gardens, beautiful parks and living landscapes are all testimony to the responsible attitude Kyalami Park has adopted toward the future sustainability of its natural environment.